Dr. Tovah Klein, called “the toddler whisperer” on Good Morning America, has penned “a parenting milestone” (Dr. Harvey Rotbart, No Regrets Parenting) with How Toddlers Thrive, which shows parents of children ages two to five how to harness the singular power of the toddler mind during what might be the most crucial time of a child’s brain development, to plant the seeds of lifelong success. Why do some children thrive, and others struggle? The answers may surprise you. New research indicates that the seeds for adult success are actually planted in the toddler years. Dr. Tovah Klein’s research and firsthand work with thousands of toddlers explains why the toddler brain is best suited to laying the foundation for success. Dr. Klein reveals the new science behind drivers such as resilience, self-reliance, self-regulation, and empathy that are more critical to success than simple intelligence. She explains what you can do today to instill these key qualities in your toddler during this crucial time, so they are on track and ready to learn when they enter school at age five. How Toddlers Thrive explains why the toddler years are different than any other period during childhood. She shows what is happening in children’s brains and bodies at this age that makes their behavior so turbulent, and why your reaction to their behavior—the way you speak to, speak about, and act toward your toddler—holds the key to a successful tomorrow and a happier today. This provocative book will inspire you to be a better parent, and give you the tools to help you nurture your child’s full potential. A smart and useful guide, this book cracks the preschooler code, revealing what you can do to help your toddler grow into a fulfilled child and adult—while helping you and your toddler live more happily together now, and every day. A thought-leader in the area of guiding parents and children through the tumultuous early years when the foundation for self-esteem, identity, and self-confidence is laid, Tovah P. Klein, PhD, is a child development psychologist and researcher and the Director of the Barnard College Center for Toddler Development in Manhattan. She has appeared on CNN, ABC, CBS, NBC, CNBC, and FOX Business, in The New York Times, The Wall Street Journal, The Washington Post, Parents, Slate.com, Huffington Post, Psychology Today, and countless other publications as their go-to toddler expert. In addition, Dr. Klein was a developmental advisor for Sesame Street, and is on the advisory boards for Room to Grow, Rwanda Educational Assistance Project, Per Dev, Ubuntu Education Fund, and LearnNow.org. She consults nationally and internationally to programs for young children and parents. She is the mother of three boys and lives with her family in New York City. Visit her at HowToddlersThrive.com. "Tovah taught me how to resist the temptation to fix everything, and instead give my children the opportunity to learn how to problem-solve for themselves." "Rarely does someone with so much knowledge write in a way that is so accessible and heartwarming. What Tovah has created will help every parent stand on their own loving ground, assured that they are creating the foundations for their child to grow into an adult who will have a deep sense of purpose and the will to effect much-needed change." "Dr. Klein has provided a critical resource for parents -- she combines state-of-the-science research with examples of and practical guidelines for everyday toddler-parent interactions. Most importantly, Dr. Klein appreciates that every toddler and parent is unique and therefore, there is no single parenting 'recipe.'" 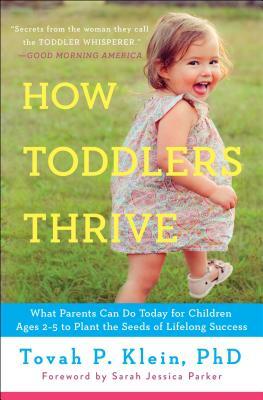 "How Toddlers Thrive shares Tovah Klein’s truly unique perspective—a thorough knowledge of child development research and practical experience working effectively with hundreds of toddlers and their families. She illuminates how the world looks and feels to toddlers and shares practical advice, such as helping toddlers learn the life skill of taking on challenges. It is the wisdom we need to thrive as parents!" "Dr. Klein's wonderful book is a parenting milestone, unraveling the mysteries of your toddler while helping you create a clear path for his or her future happiness and success." "Tovah Klein’s book is as much about parenting as it is about toddlers. Like a wise and practiced friend, she introduces us to the world of toddlers, helping us understand the wonder, worry, and bewilderment toddlers experience and the challenges and joys of parenting them. The book is filled with fabulous advice, informative anecdotes, and a point of view that teaches you to trust yourself no matter how demanding your little ones may seem to be." “Child psychologist Klein, director of the Barnard Center for Toddler Development, has a keen understanding of what makes toddlers tick. . . . Parents of the 2–5 set will find plenty of practical ideas and strategies to make the preschool years less stressful, creating what Klein describes as a relaxed and loving ‘toddlertopia.'"